Surround yourself in every imaginable luxury as you listen to the calming ocean waves and enjoy breathtaking vistas from your private lanai. 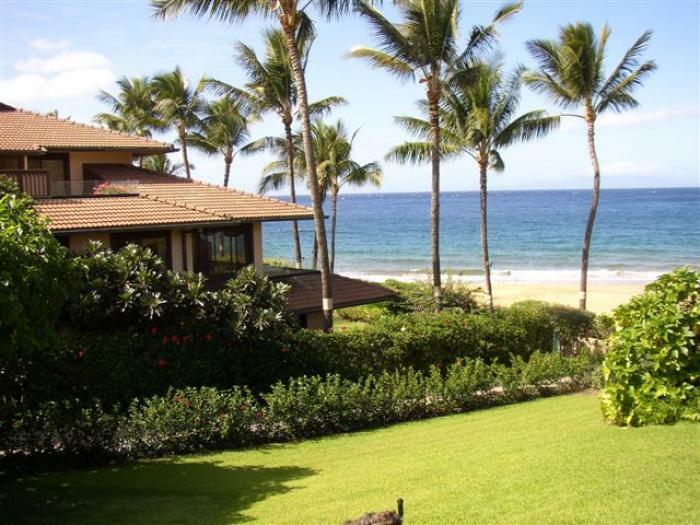 Makena Surf Resort offers peaceful and tranquil seclusion within a private gated community located in Makena. Just a short drive to The Shops of Wailea and situated on one of the best beaches in Maui this secluded resort is nestled within a lovely manicured landscape and is extremely well appointed. Perfect for couples or families looking for the ultimate in privacy, luxury and complete relaxation. Improve your tan on the sundeck, or relax inside one of our inviting condo living areas. Enjoy the romantic vision of twinkling star lights from your ocean view lanai (patio) or while you're taking a stroll along the incredible beach - it's truly a view you will never forget, and one in which you'll never want to leave. Makena Surf itself is a gated resort of some 107 units located in six oceanside, low-rise buildings along the southern Maui coastline. The resort includes two swimming pools with surrounding BBQ's (though we have our own BBQ), two whirlpool tubs, four tennis courts, and herb gardens set amidst some seven acres of manicured grounds. It is located adjacent to Wailea and approximately ½ kilometer south of the Fairmont Kea Lani and Fours Seasons Resorts and across from the fairways of the Wailea Golf Course. The Makena Golf Course is a short distance south of the property.